Yesterday, I finally found the time to head down to the CGV Yongsan cinema to watch Bong Joon-ho's 마더 (Mother). I don't want to say too much about the film, as you'll be best served going in there knowing as little as possible, but I will say that it's the best Korean film I've seen this year and is perhaps Bong Joon-ho's best work to date. It's a thriller/mystery that shares similarities with 사린의 추억 (Memories of Murder), but breaks away into new territory and gives an interesting insight into Korean mothers' love for their sons. 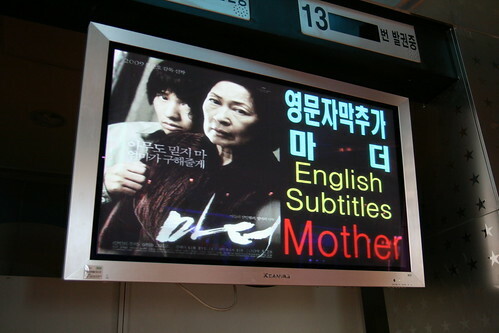 As usual you can find listings for English subtitled screenings over at The Hub of Sparkle. Go see it if you get a chance. I miss so many good Korean movie. I wish I can see it, someday. If you like Bong Joon-ho, you HAVE to check out Tokyo! I think it comes out June 30 (www.tokyothemovie.com). I preordered it on Amazon, through the site. I can’t wait. Better that NY Stories. Best tryptich since Amorres Perroes.